The Gladiators retained the Caroline Melbourne Cup after a penalty shoot out, the teams having shared two goals in a fractious ninety minutes. The match was billed as a pre season friendly, the last before the season begins for both clubs, but from the Gladiators viewpoint, they would have been more concerned about not picking up any serious injuries before the big kick off this coming weekend. Jordan Chappell limped off after one of a number of over zealous challenges from the Nailers and boss Dave Hoole might have been tempted to make wholesale changes at the interval with the result of this game being immaterial in the bigger picture of things. Sendings off were always on the cards as referee Martin Beard struggled to maintain control, and it was no surprise when there was another flashpoint on 55 minutes when Michael Williams and Danny South clashed and both went for first use of the hot water. 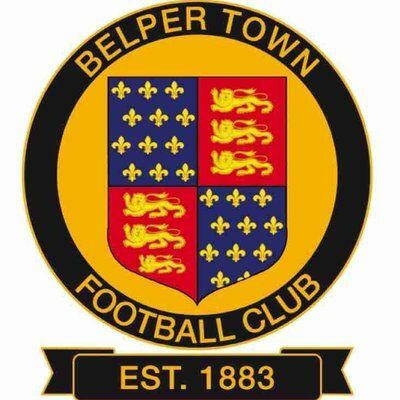 Belper, managed by former Matlock assistant boss Grant Black, also included two more ex Gladiators in striker Alex Peterson and midfielder Craig Nelthorpe in now what is largely a West Yorkshire based squad. They made a bright start, Ricky Paylor knocking a head down from South over the bar from a 5th minute free kick. Soon afterwards George Milner saw a shot well blocked before Matlock replied through Jamie Jackson who saw his low fifteen yarder held by home custodian Max Beardsmore after Marcus Marshall had neatly created the chance. But JACKSON put the Blues in front on 17 minutes. A brilliant Crossfield pass by Shaun Harrad put the speedy number eleven clear and his low shot from an angle on the right beat Beardsmore’s dive before nestling in the net off the far post. After Adam Yates headed narrowly over following penalty claims from Matlock when Jake Green looked to have been impeded following a purposeful run deep into the Belper penalty box, the hosts equalised just before the half hour mark. It was a poor goal for Matlock to concede as winger Piteu Crouz found room on the left to cross low for PETERSON to stretch and divert home from six yards. Belper were indebted to Beardsmore for two cracking saves inside a minute. Jackson cleverly found space inside the box on 35 minutes to smash a searing rising drive which was acrobatically tipped over the bar. From the corner Harrad’s power packed header was again dealt with by Beardsmore in similar fashion. The half ended with Adam Smith, who had replaced Chappell, firing too high from a Harry Vince free kick. Matlock made three changes at the interval and a further three six minutes later, one of the replacements being former Frickley and Buxton striker Luke Hinsley who was on trial and put in a promising performance. It was a half in which Matlock looked in control but after the red card incident, never got going. The visitors dominated the early exchanges after the interval but might have gone behind following a rare error from goalkeeper Richard Walton whose clearance went straight to Crouz who could only return a tame effort to a relieved Matlock number one. Jackson decided to shoot allowing Beardsmore a comfortable save on 69 minutes with two more Gladiators well placed in support and Smith drove wide from distance. Belper’s only dangerous moment was a 78th minute Nathan Curtis header which flew wide before Matlock came closest to a decider two minutes later when Louis Danquah’s measured shot rebounded off the post with Beardmore easily beaten. Referee Beard blew for time right on 90 minutes and in the penalty shoot out with Belper going first, Walton pulled off two exceptional saves from Peterson and Curtis from the Nailers first two strikes, Hinsley and Yates netting for the Gladiators for a 2-0 lead. Jake Sturgess and Marcus Day both converted to keep Belper in contention but Alex Hirst scored Matlock’s third spot kick before former Chesterfield youngster Jack Brownell comfortably stroked in the fourth and there was no way back for the Nailers. So the pre season is done with and now it’s all about the league and Lancaster City at home on Saturday. Matlock will be hoping that Chappell recovers and there are no further victims from a game which was certainly hard fought but also saw a number of home challenges overstep the line in a friendly encounter.